Captain Matty Brown insists The Shaymen will not be taking it easy between now and the end of the season. Halifax were awful in their 1-0 home defeat to Maidenhead last Saturday, producing a performance akin to that of an end-of-season testimonial match. Town’s National League safety is all-but guaranteed, but when asked what is there left to play for this season, Brown said: “If you feel like you’ve got nothing to play for as a footballer, you shouldn’t be playing. “It’s your own personal pride, your (performance) levels, your standards. “You don’t know who’s watching, some people might not be at the club next season. “People are playing for contracts, whether it’s here or elsewhere. “There’s no comfy slippers on in our dressing room. We reiterate that all the time. “We don’t want to fizzle out, we want to keep going. 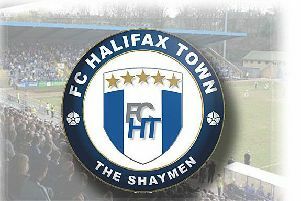 The Shaymen will have to play much better than they did last Saturday, when they produced a dire display against Maidenhead. “It was everything we didn’t want it to be,” said Brown. “It just went really stale. “The longer the game went on, they got more of a foothold in it and, credit to them, they got the win. “It was looking like it was going to be a draw and then we gave the penalty away. “Sam (Johnson) can’t pull us out of trouble all the time. “But we’ve just got to chalk it off and go again because we need to bounce back. “We don’t want our season fizzling out. It wasn’t good enough all round, it wasn’t like us. 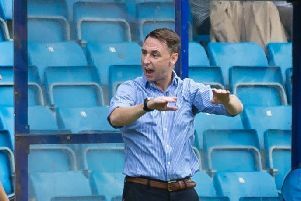 Those at The Shay will have found it hard to fathom how it was the same Halifax that swept aside promotion-hopefuls Solihull a week previously. “There’s not really much you can compare,” said Brown. “It’s football, you have days like that at times, but they’re never nice and never easy to accept. “And they won’t be accepted in that dressing room. We want to finish as high as we can, we don’t want (the season) to just fizzle out. Things don’t get any easier for Town though against table-toppers Leyton Orient. “It doesn’t, no, but we never do things the easy way do we, like going to Eastleigh and winning, no-one expected us to do that,” Brown said. “They’re the games where it wouldn’t surprise me if we went there and frustrated them, and nicked something. “We’ve been on a good run of late, and we don’t forget what we’ve done well in the past few weeks. “We’ve put ourselves in a good position, but it’d be a shame to see the season out in casual fashion, because that’s not what we’re about.